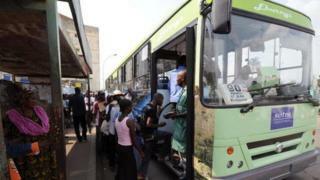 Researchers at IBM have redrawn the bus routes of Ivory Coast's largest city using mobile phone data. The research was completed as part of the Data for Development competition run by Orange which released 2.5 billion call records from five million mobile phone users in Ivory Coast. The anonymised data is the largest of its kind ever released. Such data could be used by urban planners for new infrastructure projects, said IBM. Currently the project is just a research exercise although IBM is hoping to implement it in a number of cities. Its AllAboard project used call data which pinpoints location based on which phone mast a person is close to when he or she makes a phone call. While this data is less accurate than GPS data, it provided enough information for the researchers to conclude that the city needed to add two routes to its existing infrastructure and extend another. They concentrated on bus routes in Abidjan, Ivory Coast's largest city, where the network is made up of 539 large buses, complemented by 5,000 mini-buses and 11,000 shared taxis. "We found that we could reduce the travel times of people by 10% across the city," said Olivier Verscheure, senior scientist at IBM's research laboratory in Dublin. But the project only scratched the surface of what is possible with such datasets. "If we could have merged the telco data with city data, such as the bus timetables we could have the potential to completely change the existing network," he said. Access to such data could play a crucial role in new infrastructure projects such as designing city-wide bike-sharing schemes or charging stations for electric vehicles. "Analysis of public transport and telco data would show how people move in a city and allow planners to create a bike sharing infrastructure from scratch, for example," said Mr Verscheure. "It is about understanding how people use a city, their movements and the digital signatures left by public transport to optimise the city's infrastructure." The project will be presented at a conference at Massachusetts Institute of Technology on 1 May. At the same time the winner of the Orange Data for Development competition will be announced. Can big data help fight fires and save lives?